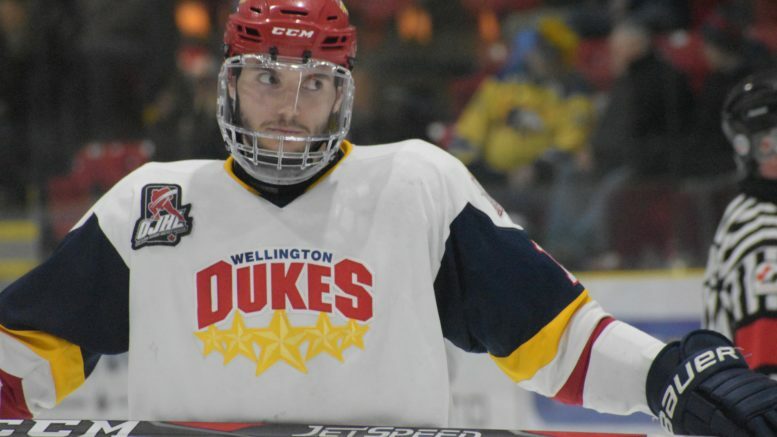 The Wellington Dukes will face elimination for the first time in the 2019 Ontario Junior Hockey League playoffs when they take to the ice on Saturday night in Whitby. The Dukes started Game 3 of the OJHL East Division final series well, building a 2-0 lead through the first period only to see the visiting Whitby Fury come all the way back and shock Wellington in overtime 3-2. So, if the defence of the 2018 Buckland Cup is to be a successful one for the Wellington Dukes hockey club, the 2019 edition will need to go to the reserves and replicate a 3-1 series comeback that started the push to past post season glory. Wellington only needs to recall the 2018 Northeastern Conference Finals against the Newmarket Hurricanes where the team trailed 3-1 and were in danger of getting bounced from the post season. The Dukes came all the back in that series and the seven game set was a turning point that lead to penultimate post season glory as the team made it all the way to the 2018 Royal Bank Cup championship game, falling to the host Chilliwack Chiefs in the final contest of the Jr. A post season. But it says here Wellington will need to dig even deeper this time around as this Fury team has been equal parts gritty, opportunistic skilled and lucky. That special combination has frustrated Wellington time and time again and now the Dukes faithful will find out if their favourite team is capable of getting up off the mat and mounting a comeback against the Fury. After a poor outing in Game 3 in which Wellington fell behind 5-0 before answering back with a goal late in the second period, the Dukes were hoping for a big bounce back effort in Game 4. Particularly, Wellington starter Logan Bateman needed a good outing in net to inspire some confidence in the players in front of him after getting lifted from action midway through the second period. Wellington got the start they wanted early in the first as Quinn Hanna’s point shot made it through a maze of legs and skipped past Whitby starter Luke Pearson at 2:31 of the first for a 1-0 lead. With less than five minutes left in the frame, the Dukes expanded the margin as Elijah Gonsalves took a Andrew Rinaldi feed in the slot and got enough of the puck to bunt it past Pearson at 15:36 to put the margin to 2-0. That two goal lead stood for a while and could have been three if not for Rinaldi standing in the crease when Ben Woodhouse’s shot got past Pearson in the early going of the second period. The officials washed out the goal immediately. That disallowed goal and a few cross bars and posts that denied Wellington a larger lead are indications that the Dukes, despite being down 3-1 in the series are very much in the Eastern Division finals. Later in the frame, the Fury started their comeback. Patrick Demaio made a slick cross crease feed and Derek McVey had a high slot tip in at 12:56 that beat a helpless Bateman. Wellington still maintained a lead until the final minute of the period. Digging in the corner to Bateman’s left, Whitby’s Shane Bull threw the pack towards the Wellington goal from behind the goal line. The puck skipped of Bateman’s right leg and into the Wellington net with just 25 seconds left. The marker was a deflating goal if there ever was one. The teams would carefully skate to an overtime period as the shots were 6-5 in favour of the visitors and even a Wellington penalty did little to amp up the action around the Dukes net. In overtime, Ben Woodhouse will manage to use a Whitby defender as a screen and rip a shot to the Fury goal that beat Pearson but was just a little wide. Just a minute or two later, a Whitby clearing attempt found Carson Gallagher at the mid ice. Wellington Dukes captain Tim Fallowfield over skated the check somewhat and ended up in a foot race with Gallagher as the two went streaking towards the Wellington net. 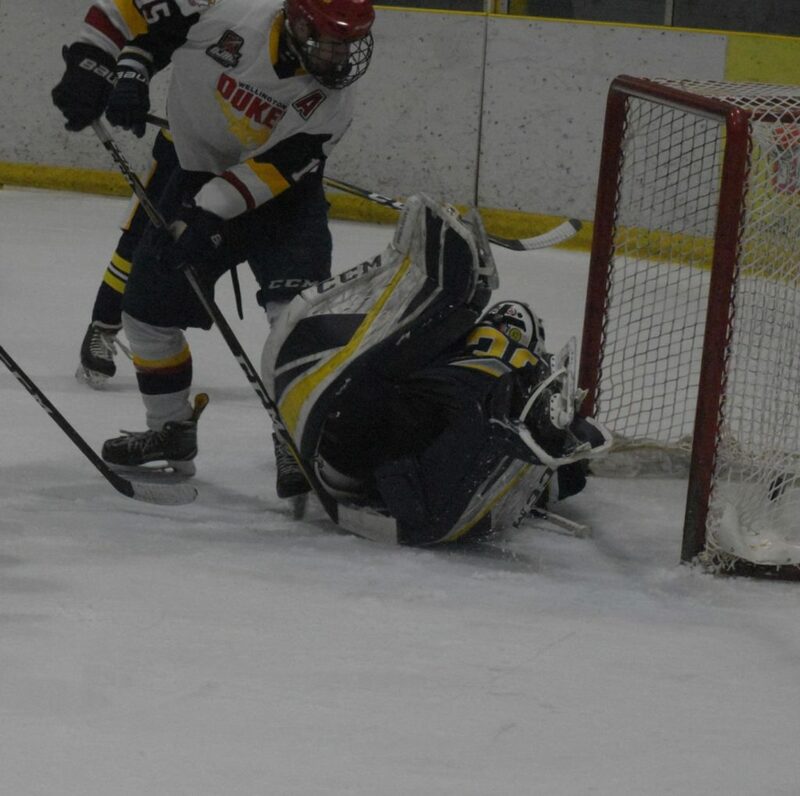 Fallowfield would hinder Gallagher somewhat but the Courtice, ON native managed to get a clean shot away on Bateman and beat the Dukes goalie low on the glove side at 3:28 of overtime. Wellington will look to extend their season on Saturday night at the Iroquois Sports Complex at 7 p.m. If the Dukes can force a Game 6, it is scheduled for Lehigh Arena on Sunday starting at 2 p.m.